That's sooo adorable! I used to be addicted to root beer, but I haven't had any for years. SO CUTE!!!!! My 13 year old loves root beer so I am going to do this for him. The gift giving is so focused on the little ones that this will be a cute treat for him. Thanks. We gave the teachers gift certificates to a local cafe and homemade cinnamon applesauce ornaments. This is sooo cute! I love root beer. Root beer are even better. This is so stinkin' cute I can hardly stand it! Definitely one to remember for next year. That is precious! I wish I had seen this a week ago when I was scrambling my brains trying to figure out what to get my kids' teacher without breaking the bank. This is perfect! These are so cute! 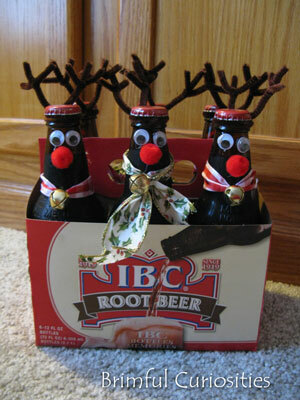 I think I might need to give these to my hubby as a joke (he hates root beer and I'm basically mean). Those are so cute! I'd love that as a gift! I'll have to keep that in mind for next year.